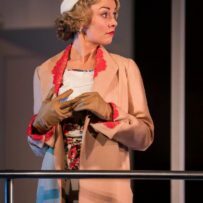 Lorna has just concluded playing the role of ‘Sybil Chase’ in PRIVATE LIVES by Noel Coward at the Gate Theatre in Dublin. This production was directed by Patrick Mason. Other recent credits include the role of ‘Cecily Cardew’ in THE IMPORTANCE OF BEING EARNEST, also at the Gate Theatre, and directed by Patrick Mason. This production subsequently toured to Charleston, South Carolina where it was performed during the ‘Spoleto Festival USA 2016’. Following this, Lorna narrated a new six-part documentary series called EMIGRATION NATION with ‘Loosehorse Productions’ for UTV Ireland. Recent film work includes the role of ‘RTÉ Reporter’ in Colin Bateman’s new Irish film THE JOURNEY, directed by Nick Hamm and starring Timothy Spall and Colm Meaney. DARE TO BE WILD, a film in which Lorna plays the lead supporting role of ‘Eve’, had its Irish and UK premiere in September 2016. In 2015, Lorna reprised her role as ‘Elizabeth Bennet’ with the Gate Theatre’s production of PRIDE AND PREJUDICE for a sell-out run at the ‘Hong Kong International Arts Festival’. Following this, Lorna went on to reprise her role as ‘Niamh’ in RISE Productions award winning play THE GAMES PEOPLE PLAY for a twenty-venue tour nationwide. Lorna also provided the voice for ‘Patricia’ in GHOSTHUNTERS: ON ICY TRAILS, an Irish co-produced film directed by Tobi Baumann. Theatre credits at the Gate Theatre include PRIDE AND PREJUDICE (Directed by Alan Stanford/ Playing the role of ‘Elizabeth Bennet’), AN IDEAL HUSBAND(Directed by Ethan McSweeny/ Playing the role of ‘Lady Gertrude Chiltern’), BEDROOM FARCE (Directed by Alan Stanford/ Playing the role of ‘Kate’) and LITTLE WOMEN (Directed by Michael Barker-Caven/ Playing the role of ‘Jo March’). Other notable theatre credits include THE BRIDGE BELOW THE TOWN (Livin Dred Theatre Company), TIC by Elizabeth Moynihan and directed by Joe Devlin, PLASTICINE (Corcadorca), SKIN AND BLISTERS (TEAM Educational Theatre Company), WALNUTS REMIND ME OF MY MOTHER by Elizabeth Moynihan and directed by Noelle Browne, JANE EYRE (City Theatre Dublin. Playing the role of ‘Jane Eyre’), ROCK PAPER SCISSORS (Performance Lab),FERRY TALES/50 WAYS TO LEAVE DÚN LAOGHAIRE (Carpet Theatre Company) and I, KEANO (Lane Productions). TV credits include LOVE/HATE (Second Series) playing the role of ‘Elaine’ and FAIR CITY, in which Lorna played the role of ‘Lucy Mallon’. Lorna is currently based between London and Dublin.